I was pleased as punch the other day while at the June Dairy Parade. The people of our wonderful town of Tillamook got up off their blankets and rickety parade chairs, and stood in honor of our American Flag as it passed. No one, not even the excited children made a sound as the soldiers displaying it, passed. Usually, just the marching band and the loud fire trucks stir me to the sup-sups during parades. This year, when we all stood and they paraded by with our beautiful flag, I couldn't keep the tears from flowing down my cheeks. Part of this reaction was due to a young gentleman who wrote me from fighting the war on terror, stating that he was thankful for ifish because he was able to chat that morning with one of his dear fishing buddies. I was proud. So proud! And so proud of our kids, who are out there in some hot, distant land, away from their family and friends, to protect you and I. God bless them, and God Bless America! Please click to read what Stan Fagerstrom has to say, today. I just updated his web page, and it's important news for some of you. Especially those of you with children. I have personally visited the Big K Guest Ranch, and I'm nodding in agreement. What Stan says here is true! A t the Big K, "I’ll guarantee that you’re a cinch to catch fish! No, really! Folks often ask me where to take their children for a good, first experience at catching fish. This would be the place! This is where you turn your kids on to fishing! Commercial trout ponds are grand, but they lack the feel of a real fishing experience. This is the real deal. You can have a real guide if you like! Fish out of a real boat, on a real flowing river! Kids want action, and The Big K has that. Not many fishing places can consist ant fast action fishing. The Big K can! It is time to start fresh. Bill's brother John, his wife Bea, and their children, Nick and Shelly put on a wonderful celebration of their Mother and Grandmothers life, yesterday. The service was simple but extremely touching. Nick sang a beautiful song accompanying himself on the guitar. A violinist played Amazing Grace. Shelly picked and arranged hydrangeas into small bouquets from Judy's yard, and we all individually placed them over her ashes as we put her to rest. Oh, how I felt for her Grandchildren! I remember so freshly losing my Grandma, and the sadness I felt. After the service, we met at John and Bea's home. I met so many wonderful people. The food was elegant and their home is simply beautiful. It will be difficult for Bill and John. The whole family, I'm sure, as they move forward. But I know that Judy will always be looking over them all with love. I never really put this together until now, but I do believe that no one in the world loves you more than your Mother does, nor your canine companion. Bill has lost both in one week. 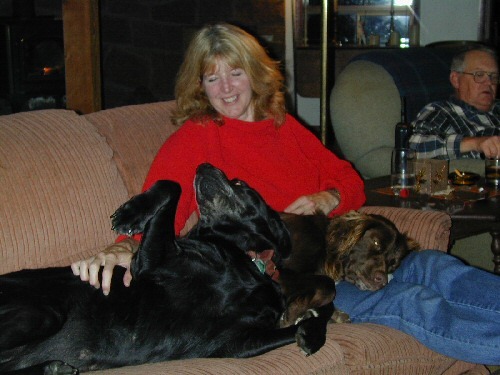 Of course, you can't ever replace your Mother, and new dogs take some time to get attached to. I'm going to work on the latter, though. Bill needs a puppy in his life. Don't you think? Let's find him one! He wants a labrador that is 50 pounds and under. I'm on a mission! Good morning! It's one of those cloudy July mornings, where you know that it will clear off and be blue, later. The weather forecast disagrees, but... we'll see! I'm going to go out and water my plants, soon. Kilchis will run around crazy around me, chasing birds, or imaginary herd of zebra... you know, whatever it is those crazy dogs see in the morning! Last night Kilchis woke me several times. I left the door to the bedroom open and he likes to go out and bark at the creatures of the night. You know... those nights when you keep getting woken, but you are too sleepy to fix the problem? Finally at 3, I rose to shut the door. I tripped over the "Kilchy place". That's Kilchis' blanket. It's handy to have, as I take it on vacations, and it's where he sleeps. "Get on the Kilchy place!" Perfect! I'm dreaming of going summer steelie fishing. I haven't been in ages. Last night before bed I rigged it up and had it all planned and ready to go to the Wilson. After last night's bad night sleep, however, here I am still in my jammies. I guess those summers will have to wait. 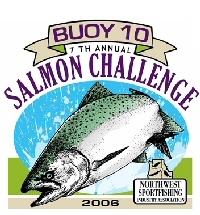 I haven't even been cutthroat fishing down in the Tillamook tidewater, yet! It's been an odd summer. Soon, I won't be around at all, because I have a lot of "catching" up to do! Pun absolutely intended! Plus, there are way less people here than there are at a campground! I was talking with David's doctor, and he was describing the logging roads that go up across the river. Get a County road map and you'll see that there is a whole world back there! Once, I spoke to Bait of Eggs (Roy, long time bb member) and he told me he took those back roads from Portland one day in the winter. I guess that it was snowing and it was quite a trip! He wished he hadn't, when he nearly got stuck up there. You know, there is no cell phone coverage. That could have been awful! I would love to bike up there someday. Put a backpack on my back, and just take off. Too bad I can't do that anymore, since my surgery. If I were Andrew and David, full of energy and motivation, I'd do it! Just take off and go explore! Tent, food and water, and the freedom of the wind in my face! Oh, that sounds grand! Maybe if I got a scooter? I don't know, but the temptation is overwhelming! Well, enough of my dreams, I'm off to feed the birds. The little swallows have an active house of babies, and it's so fun to get up close and watch the Mom and Dad with bugs in their beaks, feeding their young. I wish I could capture a good shot on my camera, but they are fairly private about their comings and goings. Here is the best that I could do! How bout a bunch of gold? Wrong color for the Fourth! That's a kind of neat shot of Mom! I have sparklers! I have sparklers! I love sparklers, and Bill surprised me with two bundles of them! I can't wait till tonight! Here's to hoping you have a wonderful 4th!!! I finally got my mitts on my favorite old jazz CD, "Ray Brown Trio, Live at the Concord Jazz Festival 1979". Music sends me. Both my kids are looking for a career in music. My Mother told me, "Jennie, you don't want to be a musician... believe me." You know, she was right. It's a difficult road. However... Music is like a drug, and once you get started, you can't stop. It just feels good. I'll never forget my first good jazz concert at a little club called "The Baked Potato" in Los Angeles. I was so turned on that I screamed out, "I found a new drug". I was mesmerized and I had the time of my life. I soon found myself hanging out there on a regular basis. A little, crowded dark hall in the midst of the hot LA summer. It was after that I started to experiment with jazz myself. Taking jazz piano lessons from Portland local Gene Confer, Eddie Weid and Pat George. Learning about trading fours, but most of all, finding a more fulfilling relationship with other musicians. There is an undeniably close relationship when accompanying someone classically. I mean, you learn to breathe together, to anticipate each other's moves, etc. In jazz, this is even more exaggerated and I learned that it was most intoxicating.. the most intoxicating thing you can do... with your clothes on. You can't talk someone out of that experience. Frankly, it's the closest you can get to someone. You actually get into the other persons brain. It's closer than having a boyfriend. In fact, I found myself jealous myself, having a boyfriend that was a musician! When I was saw him perform with other female musicians, I'd say, "Hey! You can't do that with her!!!" It's THAT close. It is! Anyhow, this CD is hard to come by, but you can just feel how they anticipate one another! Take a peek at ifish in January of 1999. That's when I first started archiving. I began building ifish in December of 1997, and bought the domain in '98. Then, we went live! I have been on some wonderful roller coasters in my life. I love them. I used to drive, fly, do anything to visit the best coasters. As I fast approach my 10th year on ifish, I must admit that this has been by far the wildest ride I have been on! And never have I been on one that had a steering wheel, but had no brake pedal! Yikes! When I first started ifish, fishing to me was a child like pleasure. Pure and joyful innocence. Fishing is what relaxed me and what excited me! It really is true and ignorant bliss! I have always been a totally joyful fisher and no one can take that from me, although they've tried! Everything about the sport brings me huge excitement and a tremendous thrill of heart! I am totally oblivious to any reason anyone could get upset over fishing spots, or methods, or techniques or gear. It seems simple to me. There are no secrets. There is no sadness related to fishing. And what on earth regarding fishing could anyone possibly argue about? I have no clue! Fishing consists of a rod, a spot on a river or lake, and a hook and line. But most of all, total peaceful joy! When I learned of a place that held fish, I talked about it! I told anyone who was interested! When I was asked to create a web page that people would go to, I started ifish. What could be more joyful and exciting to share than fishing news? Who wouldn't want to hear it? I began to write about fishing places, and my fishing experiences. Along the way, I've had to learn to keep a stiff upper lip in order to maintain my joy. (Which we'll refer to from now forward as "SUL") I've fought hard to keep that joy. I've learned more lessons in SUL than I have secret fishing spots, I'll tell you! I'll never forget my first SUL. It happened in my very early fishing years. After months of trying, and an equal amount of encouragement and excitement from the older local fishermen, I finally hooked into a beautiful salmon on the Necanicum. My pride was as wide as the fish! With help, I paraded that mighty salmon over the 12th Avenue bridge in Seaside, Oregon to my car. As I did, a lady stopped to look. I thought she was stopping to admire, but oh, was I wrong! She gave me a stern glare and whispered under her breath to her lady friend, "How could she kill such a beautiful creature!?" I was stopped as cold as the fish that lay at my feet, dead. I still relive that moment with dread. It stops my breath, but it didn't kill my joy. Nope. That's mine. She can't have it. The guy with me helped me to regain my composure as I whipped back at her, "Oh! What beautiful leather shoes you are wearing! Did those come from a dead cow?" Yeah, I zinged back. I shouldn't have. That was my first experience at defense and SUL. Since then, I've seen several examples of SUL on ifish.net. I have learned about fishing ethics on ifish, and how everyone has a different level of them. It seems that most people are so proud of their ethics that they to want to impose theirs on you. Some folks simply follow the law, and oh! I wish it were that easy! Unfortunately, sometimes our laws are slow to come, and we have to use our own noggins to act out what is best for our planet. And that, my friends, causes much distress in our fishing world. From the Asbury Park Press on 09/23/05, "According to Karin Robertson, spokesperson for the PETA campaign "Fishing Hurts", just the mere act of catching fish is cruel because it causes them pain and fear." Look out, Kilchis! You may be next! Mom loves to fish! No one on ifish that I know of holds those kinds of 'ethics" but I tell you, "ethics" on ifish are fightin' words. If you want to play, you have to keep a SUL! From battles over fly fishing... You know, calling bait fishermen nasty names-- to ethics of killing record shark or even how long you should keep your buoy unattended. Everyone thinks differently, so how do we all get along? Well... I've gone to bed in tears. It just breaks my heart to see these fights break out and see the division amongst people who have something so wonderful in common! People! Fight to keep your joy! We love fish! We love fishing! Don't work on dividing us! Find what we have in common! Fish! We are all we have and we need all of us to fight for the survival of the fish and to keep our rivers open to the fishermen and women! I have learned that the fighing tends to be cyclical, and according to the fishing season. If fishing is good, ifish is happy. If fishing is slow, watch out! "-there is no delight in knowing anything unshared." Sometimes I decide to just leave my delight behind and opt for peace. With a SUL, I still maintain my joy, and that's my ultimate goal. It breaks my heart to see someone new come on ifish and with total excitement, want to share their happiness and fishing success. It's not long before someone stomps on that joy with an ethical challenge. That just tears me up! Stop it! Over the years, I have thought about selling ifish as many times as I have been overjoyed by ifish's success and the joy that it has brought me. At those times, I've learned to open a folder of mine that is near and dear to me. It contains e mails that folks have written to me, that say nice things about ifish.net. There are plenty! I have a few of these nice letters listed here. I keep in mind how many friends have been made, how many times people have thanked me for ifish for the information gleaned, for the Salty Dogs that are heard on the radios at sea. The Salty Dogs have taken over the ocean with the saying, "Leave no dog behind!" The ones that want to leave the dogs behind have started their own private forum. I say "Yes! Please do!" I simply count my blessings, keep track of my own four walls and keep a SUL when any arguments break out. I suppose it's just human nature. Bill had a good analogy of internet forums when he said that it is like hiding behind the steering wheel of a car. People say things they wouldn't if they were face to face. Just like they rant and are rudely waving a one fingered salute behind a steering wheel, protected by the body of a moving car. I know they wouldn't act that way face to face. It's just another world on the internet. It's been a wild ride on this roller coaster that is ifish, but all in all, I'm glad there are no brakes, and I'm glad the ride hasn't stopped yet. You know, the doctor says no more roller coasters for me due to my heart condition. With a grin, I say, "bologna!" I'm secured into my bucket seats with shoulder harnesses and safety belts! I'm going to keep a SUL through all the disorienting elements-- including all the vertical loops, the zero-gravity rolls, the inclined banked curves, the corkscrew and the high-speed spiral! Ifish, I'm here to stay, and I've still got my joy! You can't take that away from me. YES! I think I'm going to ICAST!!!! !!! !!! !!! !!! !!! !!! !!! !!! Can you believe it? I even have someone to go with me to assist me! One of my moderators, Ruth! Las Vegas, here we come! Oh no! I have to get on the stick and make reservations! The rain is falling pretty hard this morning and I absolutely adore the sound of it! I had to pull myself inside the door after I let Kilchis out. Everything looks so lush and sounds so full! The full canopy of trees surrounding us makes it so muted and wonderful. I listened to this most excellent bird that sings in intervals of thirds and fourths that echo up the keyboard. It was absolutely beautiful! I felt silly, but I yelled out at it, "You have a beautiful song!" Somehow, I think it understood, because it sang even more brilliantly after that. I fished last night a bit, out back. This is just not a good time for cutts, though. Too many smolts. I have to use a huge hook to avoid their tiny nibbles. Still, it's fun to just sit there, and watch them jump for joy. It's a still pool of youngsters, leaping at flies, and jumping... well... just for the fun of it. Ah... childhood! If only I had so much energy! I have to go! I have to make reservations for ICAST! I can't stay long, and I have to pack a full suitcase of meds, and my blood testing equipment. That, and a laptop... I guess I won't be bringing clothes! Like they say, "What happens in Vegas, stays in Vegas..." --Or--- gets printed on the front page of ifish. Stay tuned! I'm leaving for Las Vegas on Sunday. I really like to attend ICAST and bring back all the news of new products. I really can't wait, this time. I'm so excited! STGRule will be going with me to help me around, and to assist... but I'm also looking forward to having a friend to sight see with! Pajama party in Vegas! Please, if I don't return your e mail, it's because I'm out of town, and trying hard to follow my rules to not overdo it! Two nights ago, I had this brilliant idea to cross the river for the first time this spring. The fish always bite better on the other side of the river, right? It looked shallow! It really did! So, with fly rod in one hand, and balancing with the other, my rubber knee boots headed out across the slippery rocks. I followed! I made it half way and panicked. My legs turned to mush. I yelled for Kilchis! I don't know what I'd do without that dog! Really! He knows when I'm in distress. Not that I'd die or anything. The water is shallow, but I could have easily gotten soaked if I'd fallen. Kilchis came to my rescue, and held strong while bent over, I clung to his neck using him as a brace. I'm really weak! That frustrates me. I can't get stronger if I can't exercise! I couldn't believe that my legs nearly gave out in a foot of current! Go back, or cross the rest of the way? It seemed about the same distance. Let's go for it! I was having a day that I actually posted on my calendar. "I felt normal for the first time in ages!" I really did! I had more energy than I knew what to do with, and I made it through an entire day with drive! Not much pain, either! Oh, if I could only figure out what was different, so that I could do that again! I have maybe two or three days like that a year. I love them! I just wish I could predict them! But, then again, what a lovely surprise! Together, Kilchis and I made it to the other shore. Man, has it changed! For all of the summers I have lived here, the pollywogs have used our side of the river for spawning. (Do frogs 'spawn'?) This year, there are tons of little slow pools on the other side! It's so cool, because when they all hatch, little frogs just cover the river beach! I suppose I'll miss that, this year. You can't even get close to the area to fish on the other side, now! It's just covered by shallow pools. It's so changed! I can't help but wonder what it will be like this Fall when the rains come. Many channels have changed and the flow is stronger closer to our shore. Near dusk, the wind came to an abrupt stop and everything was still. I spent a long time, bent over and staring into the pools. When I finally stood upright, the river seemed immense to me, and the distance back home a real challenge! I've always thought of the river at that time of night as a big mirror to the canyon. In it's stillness, it's glassy surface reflects the tallest trees and the different colors, the depth of the Grand Canyon. A small bouquet of yellow wild flowers grew next to a boulder, the size of a small car. Small but brightly lit purple flowers burst out over it's top. In the river's reflection, it appeared huge and stretched, like a giant. Created and decorated by God, it appeared to be a huge and 'gawdy' tomb stone, commemorating the thousands of salmon that die here to leave nutrients that feed those immense trees. As the sun faded behind a mountain, I glanced down to see tiny steelhead smolt darting around my boots. I stood much too long in honor of the river's amazing cycle of life. I headed back home with Kilchis as my cane. I made it! Whew! As I walked up the final trail towards home, I stopped to rest, and turned around for one last glance. The river remained nearly without current and the surface was alive with tiny steelhead smolt jumping for joy! What a magnificent sight and if all conditions that affect them are favorable, what a glorious future for our steelhead! 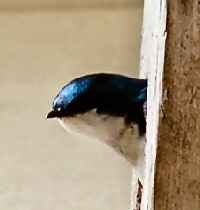 The 'green' swallows living in the house next to me have vacated, and all survived. Yay! The ones in the house in the driveway are busy and ready to take their first flight, soon! 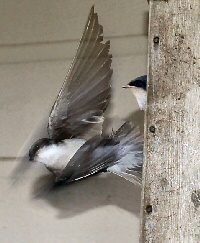 There is a nest of barn swallows in the shed. We've been watching them. There were four babies. After putting one baby back in the nest multiple times, we found it dead on the floor, two days ago. The nest is simply not large enough for four. Now, there are three or four very lively babies, and I suspect they are ready to fly, soon. It's been fun watching them. Every day there is much to do on my walk. 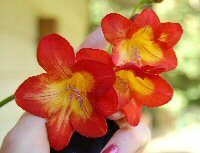 I check my freesias, which are still bringing new blooms and surprises, daily. My begonias are just coming on are a wonderful gift, and their blooms so incredible! I picked and stir fried my first snap peas and my first bok choy! I finished that with a handful of blueberries, fresh off the vine! My raspberries are checked thoroughly each day, and still we only have two flowers on a whole row of healthy bushes! Wah! What happened? Finally the deer can't get to them, and I have no pollination? What the? I'm completely enjoying a green house, outside my bedroom door. I grow tiny things in there. Starts for watermelon, crookneck, zucchini and beautiful hot house tomatoes! I'll have spinach and beets and green beans soon! As I sit here at my desk, I glance out at the meadow and a fawn and a very large doe are centered in the meadow. The fawn is darling, kicking up her heels and being silly! Against the lining of blackberry bushes, peeking out carefully are a couple tiny rabbits. What a world we live in! Last night as I tripped along the dried moss on the rocky river beach, I thought of Vegas, and how dry it is, there. When I return home, I'll appreciate the moist, warm heat of summer and the green of the world that surrounds me, here. Although I'm going to have fun there, I know I'll miss my home! Have a wonderful week! Viva Las Vegas, Ruth! I have a stitch in my side! Nope. There is my picture. What the? Is this the Sports Section, or the funnies? I just laughed. I'm still laughing. That is so funny! I still don't get it! Huh? Can I have another cuppa coffee? I shook my head. Yes, I'm awake. My Dad and brothers are going to just love this. My Father the athletic director in Canby... My Father the basketball coach... My Father, the Track Coach, the avid golfer, the bicyclist... and his daughter, "Jennie?" Athletic? The one with marfan syndrome? The musician, Jennie? Maybe they meant my nephew, Eric. Yeah, that's it. They goofed. ANYHOW, Onto the real news! This might be my last word or two until Friday or Saturday of next week. I'll try to update in Vegas, but I may be pretty busy! Have a great week, either way! So, here we are in Las Vegas. What a change of scenery! I don't know what will be the happiest moment... getting off the plane to arrive here, or getting off to come home! I suppose the weather will be about the same, I hear. I can't believe that the weather forecast for the Portland area is... 107? No fair! Half of the fun of coming home is our wonderful temperate climate! Yesterday was 108 or so, and very humid. We had an extremely exciting thunderstorm last night which I watched from under my covers! This motel has wonderfully big windows for those of us who like to make sure that our knees can see out, too. I have a great view overlooking the strip that's kind of fun. Neat to watch the lightning hit all of the different "hot" spots in town! Oh! There goes the MGM! Oh! The Bellagio just got struck! Last night we had dinner at the Rain Forest Cafe. That was my one splurge for the week. I just love that place! They sure get you in and out fast, and the food is great. The tropical fish in the huge tanks are just amazing to watch. We had fun and got these cool light up sparkly glasses. I have to turn mine on, now... just for kicks. Oh yeah! That was fun! After that, we attempted to walk to see the Bellagio water show, but it was just too uncomfortable and the walk, too long. We gave up and hailed a taxi. Oddly enough, the show playing here is "No Menopause!" Ruth got a big kick out of that. Do you realize they have an entire store here, dedicated to Barry Manilow? Oh, my! Well, it's off to figure out if we can walk to the Convention Center from here. I'm having a wheelchair delivered to my room, and we are waiting on it. I think that might come in pretty handy! I think that I'm the only woman that cried at the bass presentation from FLW Outdoors. Well? They were showing all of these happy people with their bass, and... well? I just cried! It was awesome! Makes me cry to think back to it, too! And just as I sat down to write this, Ruth broke out about a Pedigree advertisement in the FLW rag about dogs that deserve to be loved. Ironic, just the other day, I broke out at a show that said "We believe that every dog in the world, deserves a person to love them more than anything else." And yes, that was a cryin' presentation! I think it's the combination of what these shows bring me that moves me so easily to tears. I see people that I love and businesses that I work closely with who do many things, but mostly, I see them work their tail off to bring the joy of fishing to new people every day. That's our goal and we are all meeting the challenge! The video that brought alligator tears to my eyes showed kids with the most darned happy looks on their faces, holding huge, wonderful fish... and adults, kissing their catches on the lipsses! All had a wonderful smile spread across their faces. I think back to all of the happy moments I've had, holding my fish, and the many, many happy faces of friends and fellow boaters next door as they net their catches. These are probably the most touching and happiest moments of my life. Why wouldn't it move me to tears to see the whole world share that love? It's the last day of the show. I'm sitting in my hotel room. Ruth is reading a magazine she found at the show. I'm browsing through ifish, wondering how many new contacts of ours will flip on to ifish to see what it's all about. Ladies and gents, it's about our love of fish. It's about all of the ways that you and I spend our time doing it, creating new ways to enjoy it, and new equipment to do it with! It's about spreading the love of fishing! Do you know that there are 92 million spots in the world to fish? That's enough to share with the world, I think! So get out there! Find someone that needs a smile, and take them fishing with you! Expect to add another smile to the world, when you do. I'll be watching for it... and I promise to bring a kleenex to catch those tears of happiness. I suggest you bring one, too! I'll tell you. I walked more at ICAST than I have since my surgery! In trying to figure out how I did that, I would have to think it's due to Ruth and the wheelchair. Most of you know Ruth as STGRule, on ifish. Yes, that's Ruth! She went with me to Las Vegas, and thanks be to God that she did! Anyhow, Ruth repeatedly threatened me with a wheelchair. Over and over she insisted we take it. Over and over I flatly refused. I excused and reasoned and debated and discussed. Truth be as it may, we probably should have used it. However, I am a bit stubborn. I was darned if I was going to ride in that thing unless I had to. Yes, it would have been easier. Yes, I could have gone further. Yes, I wouldn't be in the shape I'm in now, but... NO. No, thank you, please. I didn't want to use it! She just shook her head. (Repeatedly.) Hey, she has to live as a moderator with me, post trip! She knows how I get after these things! Just ask her! But, heck! I did my part! I called security and ordered that dastardly thing, myself! The people there were so nice. They delivered it to my room! --and that's right where it stayed! The use of the wheelchair served one very important purpose. It was a constant reminder of "I think I can!" I walked to the monorail. I walked to the Taxi. I walked to the Convention Center where we walked down isles, being introduced to new products! I stood up straight. I swallowed my pain. I pretended I was just fine, and I was! It was a perfect practice in trying to look normal. Ruth said my legs were wobbly, but I would never admit that! She just likes to push wheelchairs. Yeah, that's it! I walked to the Lamiglas booth where we drooled over the new jig rods and the tuna rods that are just to die for. --I'm going to devote a whole column to this topic, later. Be on the watch. I just love the black wrapped cushion handle of the new jig rod. Oh... my.... gosh. I think 'Jennie' needs a new rod! I walked past the Berkley booth where we were introduced to the new FireLine Crystal braid line. Neat stuff! Bill is using the 8 pound as tippet on his fly rod! I can't wait to try the one pound at Diamond Lake. What totally cool stuff! I believe it won "Best of Show". I walked through the new product showcase and even walked back to enter my ballot into the winners ballot box. So much to tell you about... so much! Swallowing my pain, I walked past the booth where they sold the new hook protectors. Neato! I have a sample of one on my rod, right now! These new products inspired me to go on... Walk, Jennie, walk! I walked to the taxi where we took a cab to MGM and had dinner at the Rain Forest Cafe! Want a really good slaw recipe? Click here! I found that on the internet, but not as genuine. However, their cole slaw was very good, and I'm going to try this close match, tonight. I walked from one hotel, nearly to Bellagio! At that point, I gave up and got a taxi, but hey! That's a ways for me, and it was 108 degrees out! I walked to the airport, and it was there that I gave in. I was forced to sit in that darn wheelchair again, and have someone wheel me the nearly 3 miles to our departure gate. Hey. I know my limit... I think! As I sat in my chair waiting to load the plane, my legs began to ache and that old self pity started to rear it's ugly head. I've come to the conclusion that wheelchairs cause pain. Am I right? But, my self pity was interrupted by a very kind gentleman from Ordella rods who came over and shook my hand. He told me who he was, thanked me for ifish, thanked Ruth for my ability to be there, and told me that he was happy to meet me! He said that he reads ifish nearly every day! The pain began to dissipate. That gentleman changed my thinking. It was not long after that 'Ordella grin' crept across my face that I realized that I was sitting in First Class! OK, so I had a free upgrade coupon, but still! I began to think to myself just how proud I was of ifish to be sitting here, and that we were representing ifish.net at a convention is Las Vegas!!! Isn't that cool?! That just pickled me tink as I sat there. Any pain in my legs was quickly dissolved! I thought about the article in the Oregonian, and giggled yet more. "25th most influential Sports person in Oregon". Tee hee hee hee.... pain, what pain? It has to all be a dream. It has to be! Pinch me! And to beat all, yesterday was ifish's eighth Birthday! As the plane came safely to a stop, I got up and my legs trembled. Oh, the long days on my feet had really caught up with me!! But, as I glanced outside the plane door, I saw a man waiting with a wheelchair, and I walked right by him! "Who is that for?" I giggled to myself. I knew that the luggage area wasn't far. I could make it! I knew I could! I think I can... I didn't look back, but I bet you that Ruth was shaking her head! In the morning, I drove to the coast. I did it, all by myself! A little over a year ago, I almost died. Oh, what a life I live, now! Pulling into the driveway, I was so extremely excited to see the river! The house! Bill! The kids! KILCHIS!!! Kilchis did a mad happy dance around me! I tried my very best to stand up despite his every effort to knock me down. "I can't walk, Bill! I can't stand up!" My legs wobbled and oh! There it was again... The "I can't's" were creeping back into my life. All the while, Bill and I were trading stories and he was going on about what I had missed out on. Bill was carrying on about what he had brought home from Lake Oswego. "Hummingbird feeders, and a coat, and..."
I had my sights on the kitchen chair, just 15 steps in front of me, but chose instead to shorten that goal and just make it to the stairs in the garage. There! There I can sit! My legs, nearly collapsed, stopped short when Bill pointed to what 'else' he had gotten for me. "...and I brought for you my Mom's wheelchair..." He pointed, while directing me towards it. There was an awkward silence. I stopped, stiff. My legs straightened. "Oh, thank you!" I was able to blurt out. Of course, I am appreciative, but.... you know what? It was indeed the nicest thing he's done for me in a long time! "I think I can! I think I can!" It came back to me, again! "But, Bill! Later! I simply can't wait to see the river!" I giggled at my renewed momentum, once again. And I made it to the river! All the way there, and back again! Thanks again to Ruth, Bill.... and all of the wheelchairs of the world! They really do work wonders! Do you realize how many parallels and natural connections fishing has to faith? The outdoors is a great place to connect with our Creator! The river is currently my church home, and perhaps that is the way it will stay! I spent the early years of my life going to church nearly every Sunday. I played the piano softly in the background, while the minister would bow his head, and pray. I was moved by his words, and he, my music. It was an incredibly close relationship, and sometimes I felt as if I could tell what he was going to say, and he, what I was about to play. I found myself deeply moved by working so closely this way, and the incredible presence of my Heavenly Father was evident as we easily moved others through that connection. However, I find that I share my faith with God most effortlessly, through fishing! I connect with people that I thought I'd never connect with while on the river, or on ifish! I am moved by the presence of my Father through all of the wonders of nature. God gave each of us many talents, and I believe that it is no accident that God filled me with a passion for fishing. Maybe it's not a gift, per se, (You can tell that by how many fish I don't catch!) but it is my passion! I have an opportunity to share my love for my creator in a way that I never thought possible. I almost find it incredible! My Heavenly Father never ceases to amaze me! He loves each of us so much and wants so badly to give each of us exactly what makes us joyful! I get to fish! Thank you, Father!!! Here I am, a natural musician, a pianist, and I'm thinking that this is my one talent that I am to share with others. Ha! It was too obvious, I guess. I had to find my way! Who would have ever thought about fishing as a tool to bring peace and everlasting life to others? And it's so easy! I'm not good with words, spoken, but the river 'preaches' it's own invitation! This world is wild and scary and sometimes folks just aren't ready to walk into a church filled with strangers. What to wear? Will people assault you with invitations to this, and that, and come on too strong? Even as a young adult with a busy schedule flying from church to church to perform concerts, I found solace and peace and a connection to Christ, while fishing! It was my escape. Nancy Olson Chatalas, a talented opera singer with a beautiful voice was the lady that I traveled with. She would often joke during our breaks at concerts back then, that "Jennie has to go make a couple casts..." It was a joke, people would laugh... But it was the truth! After playing 'airport' or having long drives on busy freeways, I could close my car door and close off the city behind me. I could walk down a trail with trees overhead, wild flowers at my feet, and a natural tunnel that invited me into the most beautiful of all sanctuaries! No matter what city, what state, there would be a place where the quiet whistle of a dipper echoing beyond carried a tune that accompanied the music of the stream in the background. Ah! The river! Now that's my heavenly Father's home! You have no idea how many musical scores I have written that have been inspired by the music of a stream, or the song of a stream or shore bird, or the heady roll of the outgoing tides! As I reach the water's edge, there is no doubt! This is My Father's World! And thus, my favorite song! We are all fishers of men and women. As I pull my tennies on, and grab my fly rod, I worry not about what I wear, or who will see me, or if I sing in the right key, or play without err. I can speak out loud to Him, my maker, my creator, my Lord, my friend... as my cast rolls out over the calm and glassy river. What peace washes over me! This is my Father's World, and this.. This is my church home. There was a power outage last night, and I lost all of my accounts receivable that I did last night. Please remember to always save your work. Alright... I'll start from the very beginning and do those all over again! Save your work! Save your work! I took my blood pressure, (required of me every week.) and it was, eh hem... 90 over 38? Sheesh! But, I still had a pulse so I declared myself healthy and headed out to the water. I was dizzy and tired. There is a place by the river that I call my own, and at this time of summer, the flow matches that low blood pressure. Higher up in the hole, there are riffles, and just inside them, a perfect rock that juts out and remains dry enough to sit on. It's as comfortable and scenic as you can get, sitting riverside, without a patio chair. There is another rock, perfectly situated away that acts as my ottoman. The hole in front of me is deep and wide, and you can see clear to the 12 foot bottom on a sunny, late summer eve. The Kilchis river is cool, clean, and clear this year. In an almost trance like state, I sat still and lazily cast my fly in front of me, to the side, to the other. It laid out perfectly, soft and straight, landing across the pool. I have worked so hard on this cast, and finally, I am pleased. The line creates a shadow that plays beneath the glassy surface and I twitch the bug gently towards me. I can see it double. Both the actual fly, and the mirrored fly. There is always a bit of anticipation as I do this, but it was less than usual, as my mind wandered, my eyes lost in the watery pool. My back was turned to the riffles. I sit in a place that is not available to me in the winter, when the water is higher. However, during the winter months I often stand as near to it as I can to work the current with a Kwikfish, or toss a bobber and eggs to the other side, hold it high off of the middle current, and over to where a silent and still pool exists. In between both sides of stillness is a rough and tumble rapids where the water collects and narrows. It bumps and bounces, dancing over a grouping of large rocks. It's very picturesque, no matter what the season. It's a Spring, Winter, Holiday picture perfect card. Snow covered, or brightly lit with Fall leaves, or bare and bright in the summer light. I'm ever mindful in a place such as this, that you should never keep your back to the water, as I was doing last night. I never know when a fallen log or some debris might float down river, and hit me without notice. The chances of this are few in the Spring and Summer. Last night, my worries of fast flowing debris were almost non existent. Out of the blue, not one foot from my seated person, right where the water gushed through and over the rocks, I see movement in the shape of a large, (and I mean 40 pound large!!!!) living breathing animal object! It was dark gray, my mind recalls, and a piece of it brushed my dress and left a wet mark as it passed. Sitting so still, I am certain that I had gone unseen until the last moment! The moment he passed over the riffle, he must have gotten a glimpse of me. Just as it hit the deep pool, it exploded in fear! Waves and spray of water went 8 feet in the air! I was soaked and in total shock! I stood abruptly. Kilchis freaked! "Kilchis, what was that?" I screamed. I stood, dripping from head to toe. I don't know what startled Kilchis more, my scream, or the animal! That mystery thing was somewhere in the deep pool, and I stared into the depths. Had he/it/she been there, I would have seen it, even with my poor eyesight! "It" was no where to be found, so I headed downstream where the river narrows and shallows to 1-2 feet. You can see the entire structure of the river bed, all the way across, there and there was no sign of it. I stood, for quite some time, trying to collect myself. No sign, so I headed back up to the riffles, with caution. No sooner was I four feet from my chair and ottoman that it let out a warning sign, KerPLUSH again!!! Across the river. Again, this thing was HUGE! The fearless mutt Kilchis decided he would go check it out. He entered the water, and began to swim towards it. "No, Kilchis, no!" If you all recall correctly, Kilchis does not do fear. He'll walk up to anything! Me: Take picture, or save dog? 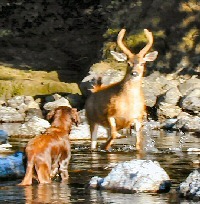 When the animal first breezed by me, I had thought it was a spawning springer, but there is no way! It had to be a beaver. No river otter that I've seen would be this large, either!! Shivering, I stared into that pool until darkness crept across the rocks. I did not see the animal again, but I now know, even though this pinch period makes it seem that the river holds no life, something does indeed live in that pool, and he cured my low blood pressure. I would not like to catch him, on hook and line! My B/P is now normal again, and I'm going to call my doctor. Never mind! No need to adjust my meds, this time, doc! This sighting worked just fine, thanks! Man, that was startling! I was one foot from a beaver and that's close! I'd adore to see it again, but please, not quite so cozy next time! I realized this morning that the birds that have been so busy out my window, have ceased to be quite so active. I was filling feeders every day for so long. Sometimes twice. It's been three days since I filled those feeders, and they remain 1/3rd full this morning. Sigh. Things are quieting down. The baby birds that were born here in the Kilchis meadow are fewer. 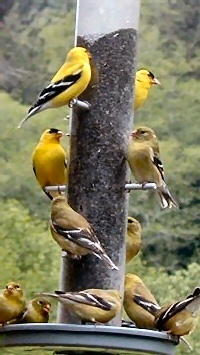 A few grosbeak still light awkwardly, swinging the black oiled sunflower feeders, trying out their voices, and practicing their beak work. I lay in bed this morning, listening to them. They crack open the seeds loudly, and spit them down to the ground, where I have to clean, weekly. The rolling lawn that spreads nearly to the river isn't quite so green. The garden, however, is rising from the earth, taller each day, producing goodies for the kitchen. The growth creates something exciting for me to do as I poke around for food, discovering that I don't know enough recipes for each [over] abundance. Too many sugar snap peas? Brush them with olive oil and sea salt. Add a couple tiny cherry tomatoes and a little Bok Choy and broil them for 6.. that's right 6 minutes, tops. Oh yeah... Good food! Too many beets? There is nothing like fresh boiled baby beets with butter and sugar. Make sure not to cut their roots, as that is what stores the color. Cut them only after cooking, and just before eating. Everyone likes purple tongues and teeth! There is nothing more charming to me than a sink full of fresh produce, a wet cutting board to the side. Sometimes I leave it there all day, just to enjoy the sight. Red Asian radishes, bright orange baby carrots, deep crimson beets. Bright light green and red lettuces, and purple green beans. Good food! It makes me feel healthy just to store it there; dripping green tops, fresh with pure well water. Oh yeah, that's good stuff. I notice the chickens aren't laying quite as heavily as in early spring. One, two, three eggs a day, compared to their earlier 8. Thank God. I've run out of friends who need them. This is perfect, just for us. Andrew is tired of his 15 banty egg omelet. Really! You can eat 15 banty eggs without getting full! They are so tiny! So cute! Bill has a new toy, and we are having fun with it. It writes, inscribes on metal. He is busy making crosses for our deceased and buried pets, and labeling them with their name, date of birth and death. We are also tagging all of our special trees and bushes. It is our tradition to buy and plant rhododendrons for our dog's graves. When we refer to them blooming in the Spring, it is, "Oh, look! Hershey's rhodie is blooming!" Thus, we are tagging them with their names, along with trees with special meaning. There is the money tree, where we hung money one year for Andrew's Birthday. There is Bill's Birthday tree. The "Jennie Rose", which is a climbing rose at the back of the house. My real middle name is Rose. Cute, huh? At Milton Fisher's celebration of life, they gave out baby conifers. One of them that we brought home to plant is doing really well. It's nearly 5 feet tall. It is inscribed and tagged with "Milton's Tree" now. All of these tags personalize our living space, and make it fun to wander around naming them, or referring to them, when something is happening. "There is a baby bunny under Milton's tree! Look!" Or, "Last night a deer ate the new leaves off of the Jennie rose!" Bill planted a row of cottonwoods that I've never been happy with. They shade my garden. Who would plant trees next to a garden when we suffer from not enough sunshine, already? I don't like the cottonwood trees, and wish he'd either label them "To be cut soon!" - Hey, I think I'll do that! He'd get a giggle or two. He loves those trees, though! Well, it's out past the Jennie rose, under Bill's Birthday Tree, down the trail to the Milton Tree and out to the river, for this girl. On the way, I'll pause to pay my respect to the Hershey and the Dee Dee rhodies. I need a break and casting a fly or two in the Kilchis River sounds perfect. Although it's the dead of summer and the new life of Spring is coming to an end, I was tickled pink yesterday to find the first ripe blackberries. I picked a couple and hurried back to the house with proof! "Look! Look! Fresh blackberries, already!" Bill laughed at my excitement. I think he was glad that he hadn't made too much of an effort to cut them back this year. I love my blackberries, and they make for wonderful pies in late summer. I freeze them, and those summer treats continue on into Fall, and late winter. The berries are still a bit tart, yet, so I'll have to wait, but I love picking them, and tasting their progress, each day. I have this thing where I can't go home until I find a ripe one. This time of year, that makes for a lot of eating, until I can quit! Nature simply amazes me and keeps me busy with expectation and giddy with wonder. I just don't know how folks do it, who live surrounded by cement and asphalt. I sure hope you come visit us at ifishstock. You'll see! You know, it's an age old problem. I'm really tired of trying to remove my favorite fish catching lipstick color off of my cork handles. It just doesn't get any worse. It just sinks in and absorbs! It's there to stay. I'm left with pink, orange or deep crimson stains on my favorite fishing rods. Well, ladies, stop sending me recipes and ideas for cleanings. I think my troubles are over! This year, while talking with Todd Vivian, Lamiglas's chief rod designer, I was transported from the ICAST convention floor, directly to the dead of winter steelhead season on the Kilchis River. When Todd handed me an XMG50 9'6" jig rod, I went dizzy with glee. The introduction of this rod is the first thing since lipstick that's turned my head about fishing in a long time! Everything in the background faded to gray. The air conditioning served as a cool reminder to the climate, back home. As the new soft comfort finish melted into in my hand, the ground beneath me seemed to turn to river rock. In my mind played the music of my beloved Kilchis River. As I applied a fresh coat of gloss to my lips, with one hand, I half expected the tip of the rod to dive as I hooked into a strong chrome steelhead. I could imagine the shock of what I might feel, should my bobber so much as twitch while riding on top of the current. The sensitivity was unbelievably incredible! I'd never felt anything like it! It was winter steelhead season right there, in Las Vegas!!! And I did! I've got to get my hands on an XMG50! Ladies and Gentlemen, really! Be prepared to be blown away! And now, for the really great part! ... John continues, "In addition to weight and sensitivity benefits, the graphite handles do not capture scents as cork does and will outlast cork over the long term. Comfort Finish reel seats keep fatigue at bay over multiple days on the water. The casting seat allows finger contact with the blank while the spin seat provides increased palm contact, delivering a firm grip with minimal pressure." Do you know what that translates to? Do you? You can simply wipe lipstick clean off of these handles! Nothing stays! Not the scent, not the color! Lipstick belongs on your lips, ladies... not on your rod handle! The XMG50 helps make this possible! FINALLY! I can't wait to introduce this rod to you, and I will have one by the time ifishstock 2006 rolls around. I'm saving my pennies! Ask me about it! I'll be glad to show it off! (Tickled 'Fizzy Pink', actually!) This is the first rod I've bought in ages! ... and it will not have a whisper of lipstick on it! Girls, this is my promise! Even if you don't wear lipstick, this rod is for you.